Book of Mormon Central / Archive / Sketch of "Alma Baptizing in the Waters of Mormon"
Title Sketch of "Alma Baptizing in the Waters of Mormon"
10 1⁄2 x 12 3⁄4 in. 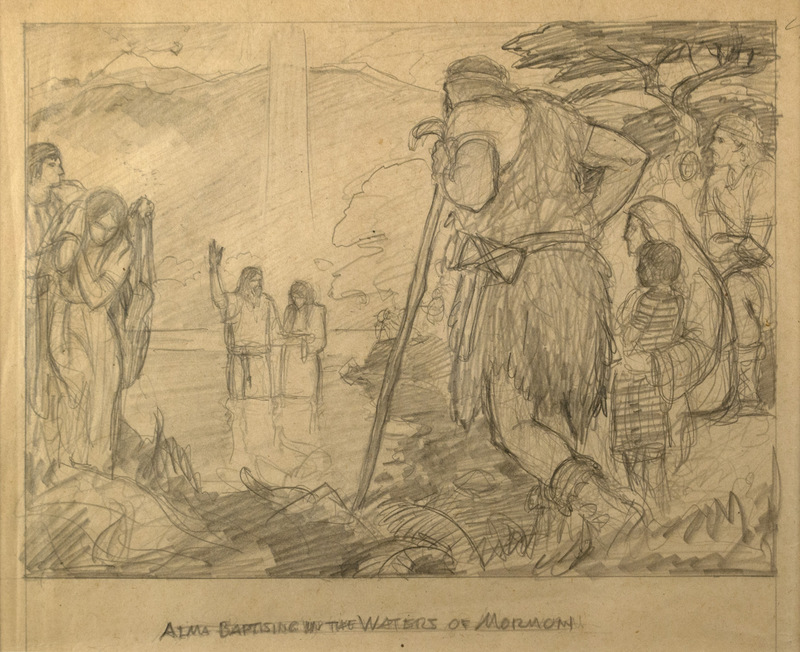 This first full compositional drawing for the painting Alma Baptizes in the Waters of Mormon is, arguably, much less overwrought than the final work. It retains all of the key elements of the final work, including Alma baptizing in the background and figures of all ages either having just received the ordinance themselves or waiting to be baptized. Unlike the finished work, Friberg has a shaft of light from the sky lighting down on Alma. The entire composition is reminiscent of many traditional depictions of the baptism of Jesus Christ by John the Baptist. We see many of the same figures, including the mountainous background in Battesimo de cristo (c. 1450) by Piero della Francesca (Italian, c. 1450 - 1492), a widely reproduced work that would have been familiar to Friberg. To these familiar elements, Friberg adds the particulars of the Mormon practice in the raising the hand to the square and a New World landscape that resembles Yosemite Falls.